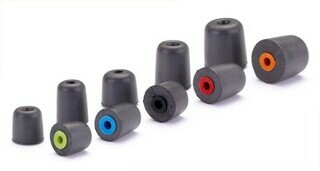 This combo pack contains 5 pairs of Westone True-Fit Tips: 1 pair each of orange, red, black, blue, and green tips. Try them all and find the very best earphone tips to fit your unique ears. Already know which True-Fit Tips color/size you prefer? You can buy single pairs (or hundreds!) here. Tip: If you prefer a silicone tip over a foam tip, check out our Westone STAR Tips™ Combo Pack. Westone True-Fit™ Tips for Universal In-Ear Monitors and Earphones Combo Pack (5 Pairs)5cbenderAugust 3, 2017I bought a pair of amplifier/ear protection in-ear plugs and they worked pretty well, but the tips weren't ideal, nor were they big enough, either in length or diameter. These foam Westone tips fit my plugs, and my ears, They work much better than the originals, as well as isolating external sounds better. These plug tips should be on the front pages of this site. They're Great!!! Just be sure your plugs use 2.5 mm posts... the tip will measure 3 mm using a metric caliper.